It is a sad fact that civilizations, in times of decline, produce men and women who, lacking any creative genius of their own, take delight in attempting to ridicule the accomplishments of those who came before them. Such, regrettably, is the treatment that some smug American "scholars" have seen fit to give the reputation of Sir Edward Bulwer Lytton. Indeed, if one does a search for "Bulwer Lytton" on Google, the first site listed (at least of this writing) is The Bulwer-Lytton Fiction Contest, "where www means wretched writers welcome." The contest has been sponsored since 1982 by the otherwise undistinguished English Department at San Jose State University. Bulwer Lytton's name was posthumously attached to this contest for bad writers as a result of his having once begun a novel with the words, "It was a dark and stormy night." The full first line, from the novel Paul Clifford, reads: "It was a dark and stormy night; the rain fell in torrents - except at occasional intervals, when it was checked by a violent gust of wind which swept up the streets (for it is in London that our scene lies), rattling along the house-tops, and fiercely agitating the scanty flame of the lamps that struggled against the darkness." The question before us is simply this: Is it appropriate for an American university to besmirch the reputation of the English Victorian novelist Sir Edward Bulwer Lytton? I think not. My guess is that the vast majority of those participating in this contest are unfamiliar with Bulwer Lytton's life and works, and simply find it more convenient to engage in a foolish contest than to actually risk the chance of bettering their education by familiarizing themselves with the man and his writings. Regarding the novels, many now appear on the internet as a result of the expiration of their copyrights, and some are once again in print. An excerpt from Vril appears here on this website. Few writers have done more, or achieved higher distinction in various walks--as a novelist, poet, dramatist, historian, essayist, orator, and politician. He has worked his way step by step, disdainful of ease, and animated throughout by the ardent desire to excel. On the score of mere industry, there are few living English writers who have written so much, and none that have produced so much of high quality. The industry of Bulwer is entitled to all the greater praise that it has been entirely self-imposed. To hunt, and shoot, and live at ease,--to frequent the clubs and enjoy the opera, with the variety of London visiting and sight-seeing during the "season," and then off to the country mansion, with its well-stocked preserves, and its thousand delightful outdoor pleasures,--to travel abroad, to Paris, Vienna, or Rome,--all this is excessively attractive to a lover of pleasure and a man of fortune, and by no means calculated to make him voluntarily undertake continuous labour of any kind. Yet these pleasures, all within his reach, Bulwer must, as compared with men born to similar estate, have denied himself in assuming the position and pursuing the career of a literary man. Like Byron, his first effort was poetical ('Weeds and Wild Flowers'), and a failure. His second was a novel ('Falkland'), and it proved a failure too. A man of weaker nerve would have dropped authorship; but Bulwer had pluck and perseverance; and he worked on, determined to succeed. He was incessantly industrious, read extensively, and from failure went courageously onwards to success. 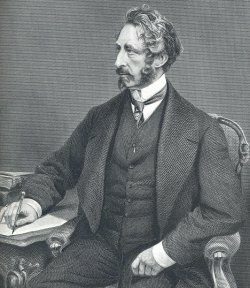 'Pelham' followed 'Falkland' within a year, and the remainder of Bulwer's literary life, now extending over a period of thirty years, has been a succession of triumphs. Here we have a clear difference of opinion. In his own time, Bulwer Lytton was held up as an example of literary success. In our time, his name is associated with a sophomoric contest related to bad writing. Were British Victorians such poor judges of decent literature, compared with modern-day Californians? Or is the joke, ultimately, on San Jose State University? To consider the broader question of whether an American University is actually engaging (as many do) in an exercise of smug anti-intellectualism in this instance, one could do worse than to seek out a copy of Jacques Barzun's now sadly-out-of-print The House of Intellect .